When I think Splendid, I think quality. Soft-to-touch, it’s an “I want to wear it, sleep in it, and never take it off” kind of quality. This isn’t the first time I’ve bragged on the softest brand on earth (Splendid) and definitely not the last. 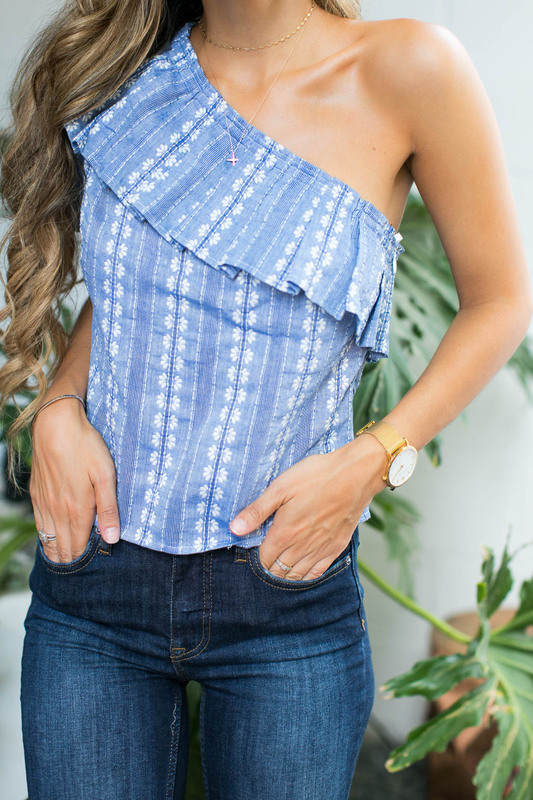 Here comes the bragging: I’m boasting about Splendid’s soft-to-touch fabrics, high-quality, pretty much wrinkle-free designs, and their simple-yet-classic silhouettes. Any darling who loves outfitting herself in a quintessential classic look and a high-quality investment piece is a lover of all things Splendid. Plus — simply saying the name splendid feels so…splendid! Last week, I popped on over to East Side’s most darling new hot spot, Grizzelda’s, in search of their stunning interiors (and exteriors! ), pink margaritas, noteworthy Tex-Mex bites, absolutely girly ambiance (in the best way possible) and good company. Austin — if you haven’t checked out the new Eastside it-spot, the time is now! And to top off the retro-chic interiors, comfy-chic outfits were top of mind. Today, I’ve partnered with Nordstrom & Splendid to talk my favorite pieces on Nordstrom.com. I begin with this darling one-shoulder chambray beauty: the softest dress I’ll ever own and a class staple for the wardrobe. Looking for a July 4th look? This babe will steal the show. This sweet one-shoulder embroidered blouse is just as cute, taking a similar look to the dress. I’m also quite the fan of this everyday dress (not shown in this post), but I highly recommend a dress like this for summer errands and running around the town in the heat. A cool frock like this one is always the answer. I paired these darling Splendid looks with classic accessories, most of my favorites living on the beautifully curated pages of Nordstrom.com. Shop my look via the thumbnails below and be sure to find the rest of the Splendid looks here. Thank you Splendid for sponsoring this post. All opinions are my own. I actually had one of their tops in maternity, and I agree with everything you said. SOOO soft! I think I need to grab one of these now that I am not pregnant and can get even more wear out of it. Love the one shoulder! Love both of your outfits!! I’m loving denim lately! Such cute looks! Loving your blog’s new makeover! Not sure when you did this, since I’ve been reading through the bloglovin app usually. Great outfits! Loving these summer looks! That denim dress is the cutest! I was like wow after I scroll all pictures down. Your style is incredible and it doesn’t hurt that you are absolutely beautiful!! I love Splendid! That dress is so pretty and perfect for summer. Love to slides too, you’re such a cutie! I love the fringed denim dress it looks great on you! I also love the shoes you matched with it! You have such great style. Splendid has the best pieces! I have these two on my wishlist!